I've used a head of garlic halved in several different dishes, and it really takes the flavor to a new level. It's also faster and easier than any other type of flavor delivery, and you won't have to worry about your kids biting into a chunk of garlic. Peeling garlic can be a pain, but I've discovered that you can skip the hassle while improving the flavor. If you thought that you had to completely remove the papery cover, you'll be thrilled to learn that you can leave the skin in place. I have a busy household, and I've found that this simple trick not only improves my meals but also gets me out of the kitchen faster. 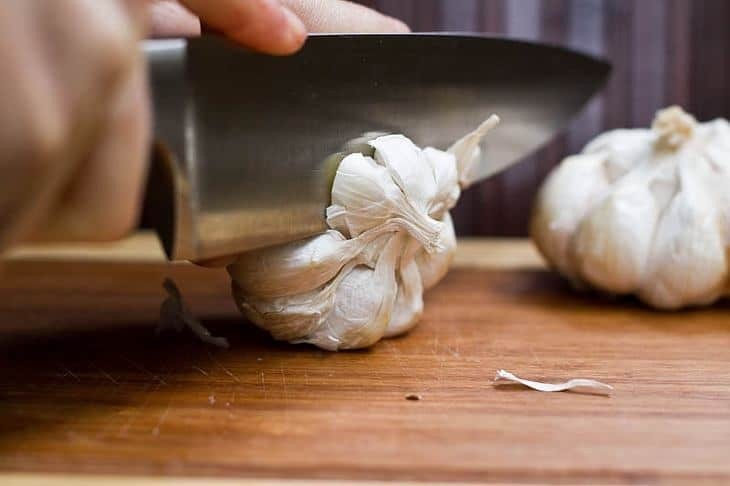 Here's what you need to know about adding that delicious garlic flavor to dishes with one simple swipe of your knife. When you head to the store, there are several different options for garlic. You can buy it in powdered form and just leave it in the spice cabinet, or you can get minced garlic in olive oil. Another option is the little mesh bags with whole garlic cloves. However, what you really want is a loose garlic bulb that you can squeeze and feel. It's as fresh as you can get, and it's easy to work with. Choose one that's plump with taut skin that's largely intact. The ones with the best flavor are heavy and feel more substantial in your hand. 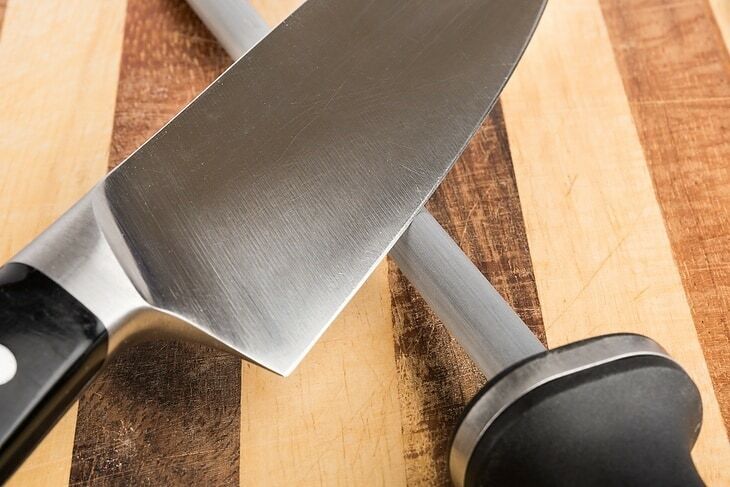 It doesn't matter if you pull out your favorite chopping knife or a smaller paring knife. The important thing is that the blade is nice and sharp so that you can easily slice through the garlic cloves and peel in one fluid motion. An ﻿﻿Utility Knife would be a great choice due to its convenience. A sharp knife will move through the layers without bruising or damaging the plant, and the result is a purer flavor. This is important if you want the garlic flavor to stand out in your entrée. If you're roasting garlic, then you want to have the supplies on hand to bring out the marvelous flavor. 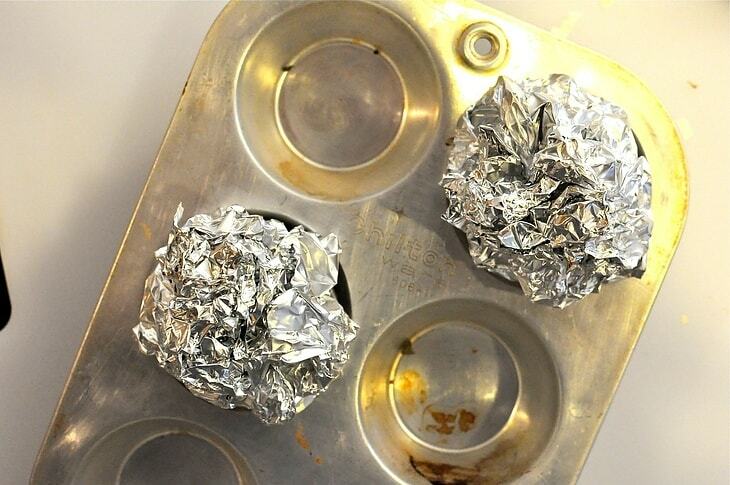 Once the garlic is halved, you can set it upright in a muffin pan to prevent it from rolling around. The olive oi﻿﻿l prevents the garlic from drying out while it's roasting, and a high-quality oil will leave you with a rich flavor. 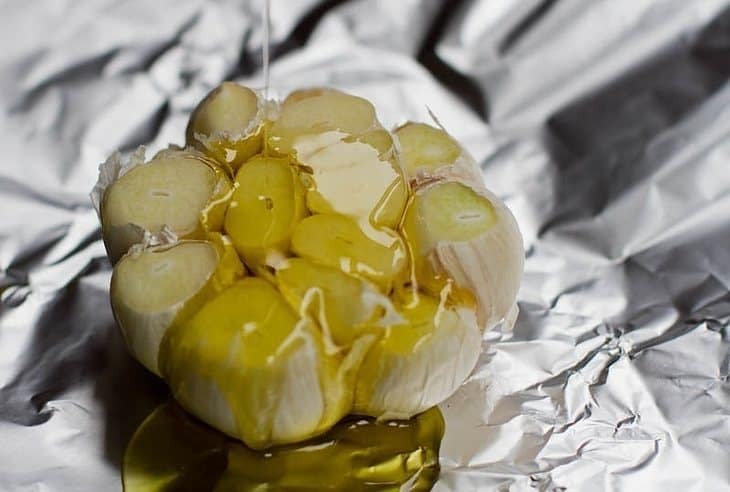 When it comes to the aluminum foil, choose a thicker product that will keep the moisture in so that your garlic will retain its wonderful flavor. If you're roasting fresh garlic for a recipe, then you'll want to cut it along the equator. When you look at the intact garlic clove, you'll note that it has a pointed end and the inverted bulb. Lay cloves on the cutting board with the pointed end and squat bulb to the sides. Make one cut directly between these ends. Think of it as cutting through the equator. Try to make the halves evenly matched in size. The bulb will then resemble a tree trunk as you can see the rings of the different cloves. There are all types of tools available to make peeling garlic easier, but you won't need any of them to roast a garlic half. That's because the skin of the garlic is what will hold your cloves in place. Some of it will flake off when you cut through, but you should try to leave as much of it intact as possible. It won't hurt your dish any to have this in, and the paper generally won't just come off on its own. This will keep the garlic bulb nice and moist as it cooks in the oven because the aluminum foil seals in the garlic's juices. 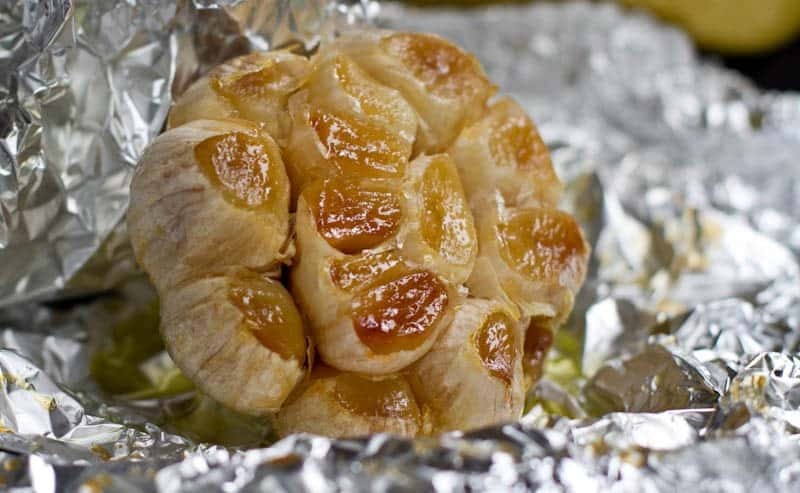 Put each garlic bulb half on a piece of aluminum foil. You can add some flavor by using salt, black pepper or herb like basil, rosemary or tarragon﻿. Sprinkle about a teaspoon of olive oil over the exposed cut. Wrap the foil tightly over the bulb. Set each clove in one cup of the muffin pan with the open ends facing up. After this step, the bulbs will be soft to the touch without feeling very mushy. Bake the bulbs in the oven at 400 degrees for 30 to 45 minutes. Remove them from the oven and leave the garlic covered in the foil to cool. Unwrap the clove completely so that the lower skin is exposed. Use a sharp knife to cut the skin around the clove. Pull the roasted cloves out of this skin by using a cocktail fork or your fingers. Roasted garlic actually has a highly attractive caramel color that makes a great garnish. The flavor is quite appealing, and some people may be willing to nibble on it as an appetizer. If you're serving an elegant meal, use the halved garlic heads as a garnish on your salads. Your guests can rub it along the outer edge of their plates to add some delicious garlic, or they can just set it to the side. Either way, you'll make the salad more visually appealing and interesting. Once the cloves are removed from the papery skin, you can eat the cloves as they are, but they're great in salads. 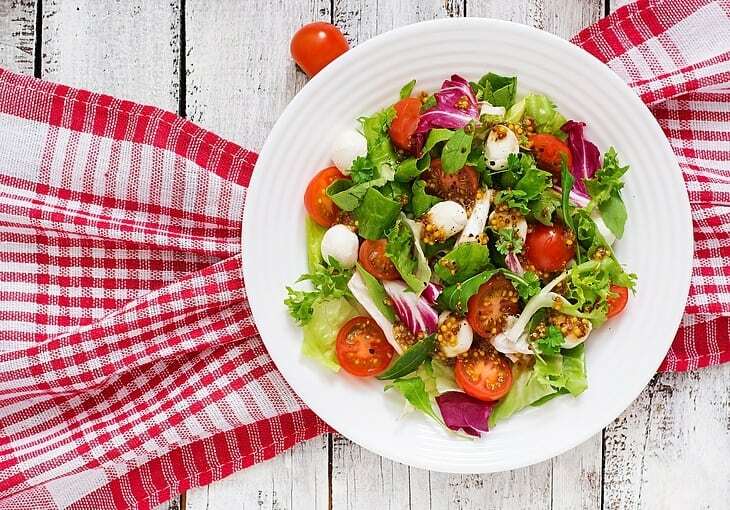 You can use the halved garlic to add a little spice to your salad without altering the texture. I've tried using minced garlic in my greens, but it can give the dish too much punch. Just simply rub the garlic clove along the inside of your salad bowl to give the greens some flavor without going overboard. It's an easy way to add some seasoning to the bland iceberg lettuce, and it will work nicely with most salad dressings. Once you've coated the interior of the bowl, simply toss your salad like normal and prepare to enjoy the fresh taste. I love Caesar salads for that tangy bite in the dressing, and I've found that garlic is just as important as the anchovies. You only want a subtle finish, so it's important that you don't add too much to the dish. Some recipes call for soaking minced garlic with olive oil, but this can lead to an overly harsh taste. I've found that the roasted and halved clove works better. Let the halved garlic sit with the cut side down in 1/2 cup of olive oil for 30 mins. 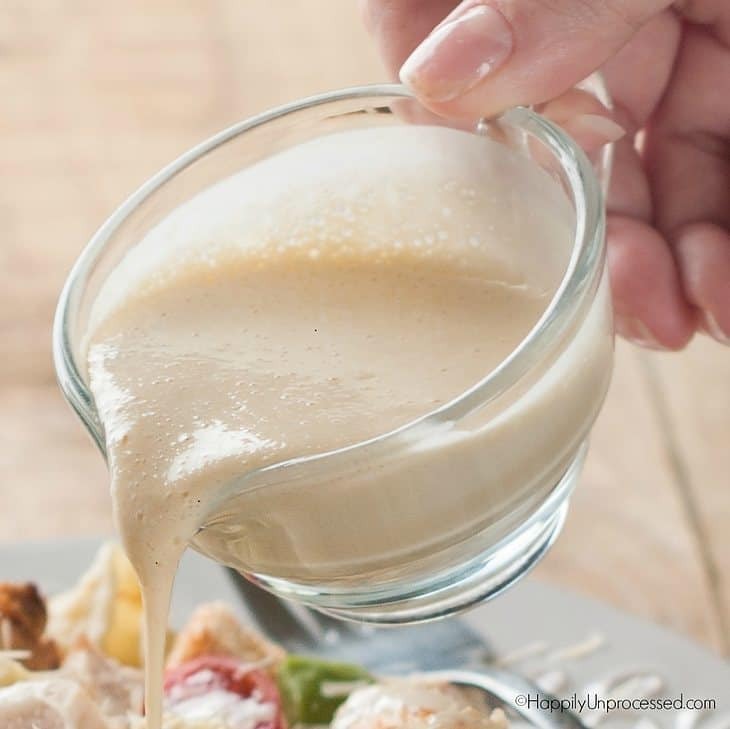 Remove the garlic, whisk in 2 eggs and 1 teaspoon of anchovy paste until the dressing is creamy. Add 1/4 cup of lemon juice to thin it down slightly. Whisk 2 ounces of ﻿Parmesan cheese in to finish off the dressing. 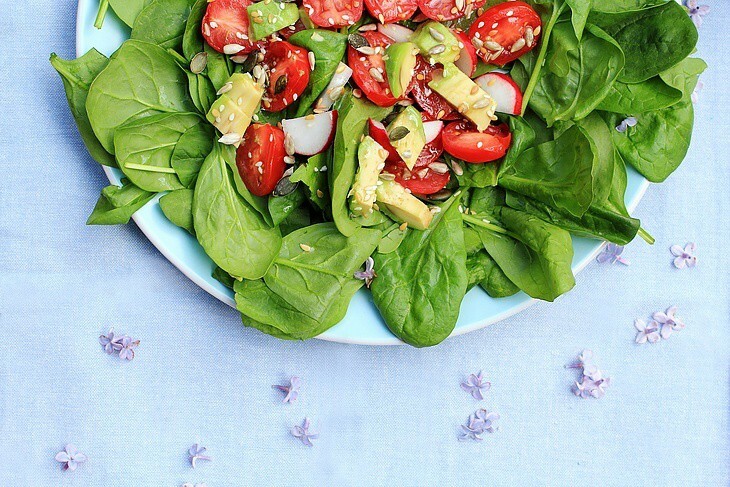 Fresh spinach is taking over as the salad of choice in some households. It's rich in iron and has a pleasant texture, but you may find that the flavor is a little disappointing. 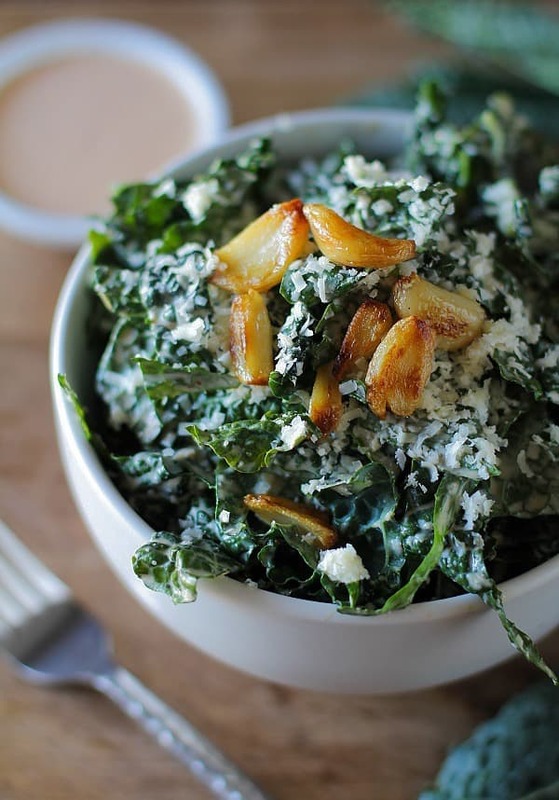 Before mixing your spinach salad, rub a halved garlic clove along the inside of the bowl and even the mixing spoon. I've also removed the papery skin so that the cloves can fall apart and tossed them right into the salad. After I have the spinach, tomatoes and croutons mixed, I remove the garlic cloves. The result is a nice little hint of garlic without any bitter chunks that might interfere with the dressing. Be sure to dig through the salad carefully to ensure that you've removed all the cloves before adding the dressing. 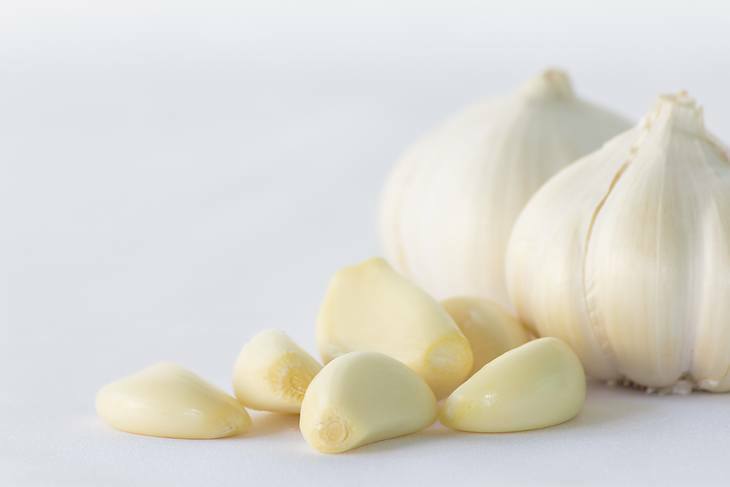 Store your garlic in a dry, dark place with plenty of air circulation. You can leave it in the fridge for future use in all your favorite dishes, including meats, vegetables and quiches. Just be sure to use it within a few hours of removing it from the cool environment. Another option is to store the garlic under an unglazed clay flowerpot in a cupboard. This allows you to create a little humidor while allowing for some air circulation. 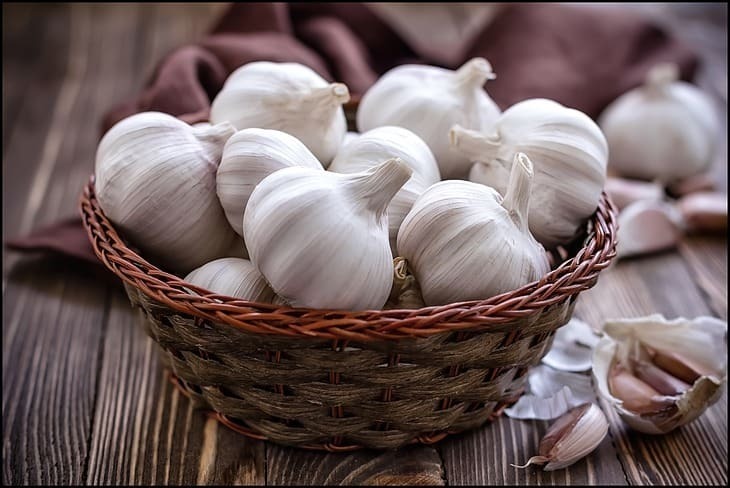 Check out 5 Best Way To Preserve Garlic You Might Not Know ﻿﻿to know how to keep your garlic properly. Vegetables and herbs start to lose their flavor and nutrients as soon as they're cut. This is why it's ideal to cut the garlic and other vegetables right before you place them in the pan. 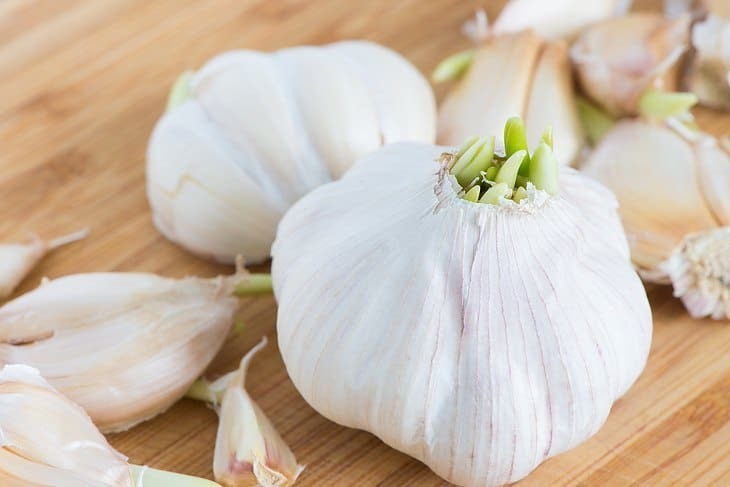 Rather than cutting it ahead of time and leaving it in a little bowl, slice and dice garlic bulbs on the counter by your stove and get them into the dish as soon as possible. You'll get more of the flavor into your food. 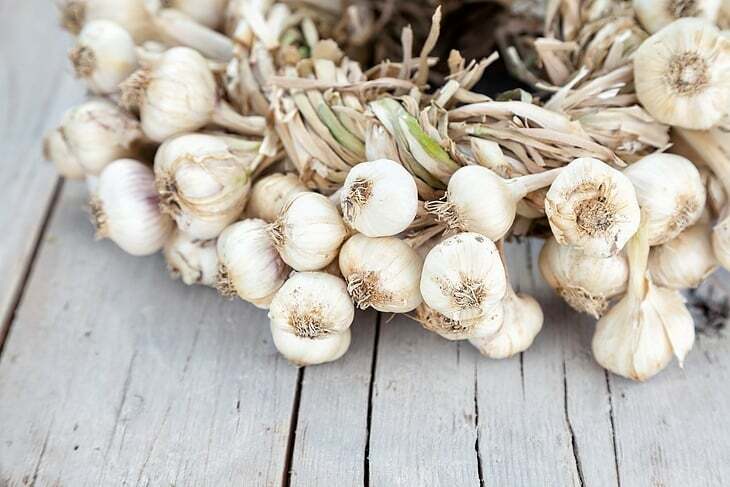 Vegetables that enter the home are still alive in that they can often continue to grow, and garlic is no exception. Garlic that's been around for a while can start to sprout some fresh growth, and this is your chance to get truly fresh garlic. Rather than tossing the affected cloves, plant them close together in a pot and let them grow. The new shoots can be used like chives, and they'll give your dish a mild garlic flavor. You don't have time to waste peeling garlic and trying to chop up the cloves. When you choose to add a halved garlic head, you can get the subtle garlic flavor in a fraction of the time. As a busy mom, I appreciate this little shortcut. I've also started making my own roasted garlic because it has a beautiful rich flavor that I just don't find with the pre-made options. I make some ahead of time and use them in dishes throughout the week to bring in that great taste without creating extra work for myself. 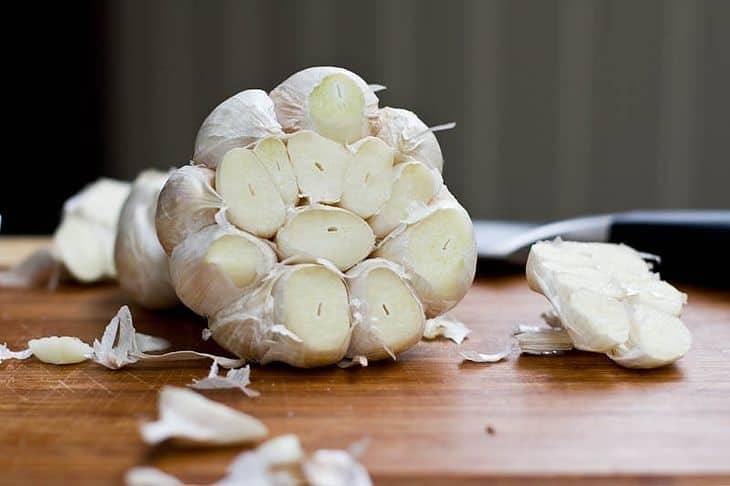 Now that you know the trick to cooking with raw garlic, you can save time and make the kitchen a more enjoyable place. What do you think of my method for halved garlic? Leave your thoughts in the comments and share these tips with a friend!